Looking for a different flavor for your next event? Something comforting and unpretentious that will bring out the kid in your guests? Velasquez Catering & Concessions can bring the taste of the State Fair to you. In addition to Fair Food, our family has proud Tex-Mex and American Southern traditions, and when we’re not running the deep fryers at the Fair, we love cooking the meals that have been passed down to us through generations. The State Fair classics you love, Tex-Mex from three generations of Mexican-Americans living in Texas, and American comfort food like Mom used to make. The State Fair of Texas runs September 26 – October 19, 2014. Visit one of our three locations and try our new Deep Fried Sweet Tea (2014 Big Tex Choice Awards Semi-Finalist). 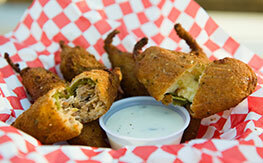 Deep-Fried Sweet Tea Featured in Eater Dallas!